Notice how the bike signal is green while the adjacent lanes are still red. 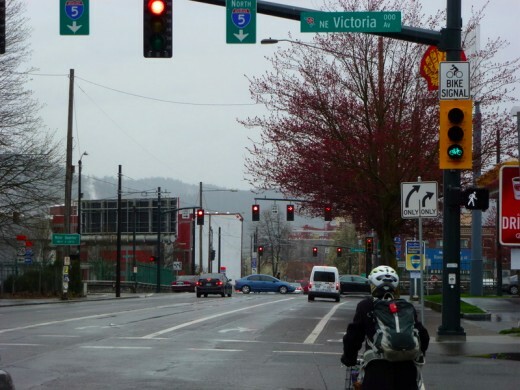 The Portland Bureau of Transportation (PBOT) installed a new bike signal on NE Broadway and Victoria earlier this week. The signal is just one block east of the bike-only signal Williams that has been in operation since October 2010. This signal is also integrated with the one at Williams so that bike traffic gets a bit of a “green wave” when headed westbound on Broadway toward downtown. 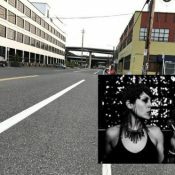 is in charge of Portland’s traffic signals. 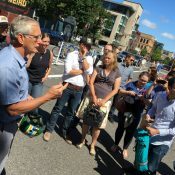 This is just the latest example of PBOT’s attention to bicycle traffic when planning signals and signal timing, thanks in large part to the head of PBOT’s Signals Division, Peter Koonce. Koonce not only uses a bicycle as his primary vehicle around town, he is also a nationally recognized expert in the field of “Intelligent Transportation Systems” (ITS). Koonce was behind the signal timing changes that made the NE 12th overcrossing project possible and you might have noticed his handiwork while hitting all the greens biking north up Williams Avenue. Maybe next up: a little reminder that the bike lane moves up against the curb at 6th Ave? Gets me every time. it’s there everytime, hasn’t changed yet. It used to be all greens up from Rose Quarter TC through Broadway, but it changed a month or two ago. From what I can tell, it seems like the change was made to make it easier to hit all green lights on Broadway going east and then hit a green when turning onto Williams. Has not enough time for bikes to get though the signal cycle really been a problem at this intersection? How many more bikes through this intersection is a few seconds really going to allow? 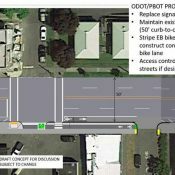 It’s great that PBOT is thinking of and willing to try ideas like this “leading bicycle interval”, but in the situation shown in the picture illustrating this story, there doesn’t seem to be much of a need for it considering that the bike lane continues across the intersection. If instead, there were curbside car parking across the intersection that obliged bike traffic to merge into the main lane of traffic, a need for the “leading bicycle interval” signal would be clearer. Think of the person on a bicycle as “threading the needle'” through these intersections and this bicycle interval gives us a larger window of time to move bikes through without stopping. Peter…your explanation makes some sense. I suppose you’ve seen examples of how much improvement this signal can result in. Not that it makes a big difference, but I think some people might be interested to know how the several seconds in the signal cycle for the bike ‘pre-green’ signal was provided for; whether main lane signal was reduced or lengthened to find those several seconds. I ride through everyday on the way to PSU. Some enforcement at Williams would be good; lots of people in their autos still turn right on red despite the sign and then the RED LED LIT SIGNAL THAT SAYS DON’T TURN. Annoys the hell out of me. my present practice is to move over two lanes to the left a block or two ahead of this mess, so that i am in the through lane when the two forced right lanes begin. presumably the idea of advancing the light here is to allow cyclists to clear williams entirely before they are overtaken by the motorists who were held back at victoria. i may try it once to see how it works. Yep me too. I never feel very safe though so if this solution enables me to stay right and still get a semi green wave, great. Motorists will maybe think we are running a red light when we go, but its a great idea. Thanks PBOT we love the effort you’re making. Surprised that this isn’t done at more intersections already. Also, even more surprised Portland thought to do this. The I-5 sign should be a dead giveaway. ride safe! Yay! And a Lead Pedestrian Interval too! The pedestrian signal westbound on NW Glisan at 14th (? right before you cross over 405) has had a pre-green for some time. It prevents right hooks on pedestrians by westbound vehicles making right turns. Makes enormous sense for all bike signals to be the same, anywhere there is a similar lane configuration. Does this mean you plan to fix the mess of signals at N. Benton and N. Larrabee on the approach to the Broadway bridge. Not remotely threading any needles there. This is great. I was right hooked at Broadway & Victoria not 4 weeks ago pedaling to catch the green light at Williams. Made an impromptu visit to the Emanuel ER. Sorta feels like they did it just for me! PDXTom A little hard to do that when the street is two way, but when all the construction is done PBOT will work on synchronization there. Gregg and SteveB – appreciate your comments. Did I miss a mention of the optimum speed to gracefully flow with the synchronization? 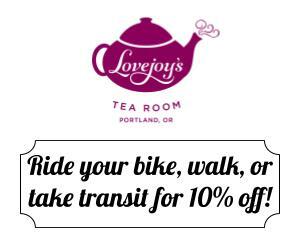 Isn’t it 15 – 17 mph downtown? 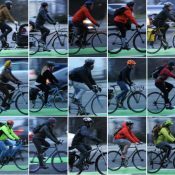 Commuting cyclists want to know … what’s the magic number for cyclists here? These signals confuse me, and they confuse motorists. This is now the scariest section of my bike commute down Broadway. The first time I rode this section on my bike, I almost got killed. 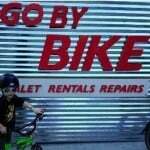 I just saw a green traffic light, and started biked ahead. I didn’t know there was a separate “bike” light newly installed that was red. The bike light is so tiny compared to normal traffic lights. Unless you are actively looking for it, you don’t really see it. When you are barelling down Broadway at 16 mph on your bike, and you see a green traffic light, you just go. You don’t think to yourself, “I wonder if that is a traffic light for a car, or a traffic light for a bike, or a….”. 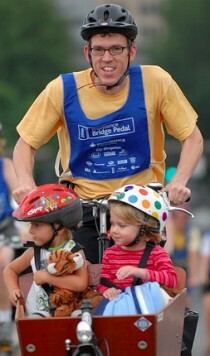 If we had to do that at every intersection as bicyclists, we’d never get anywhere. I think for people who know this intersection well, and are expecting there to be a separate bike light, it’s all good. But for people who don’t bike this often, if ever, somebody is going to get hit and hurt, really fast. I don’t know if any of that made sense. You really have to go bike the thing to try and understand what the hell I am getting at here. Oh. And don’t even get me STARTED on the motorists who are illegally turning right when the bike signal is green. When you are barelling down Broadway at 16 mph on your bike, and you see a green traffic light, you just go. Worst instersection in PDX, a total mess, congested and getting worse everyday. I went through it last week and thought to myself that every time they try to do something to the intersection, it just gets worse and worse. The twin turn lanes do not work, and clog the rest of the street. Avoid this malfunction junction at all costs. Change “cyclists” to “Oregonians” and you’re more accurate. Seriously, traffic control device compliance is next to zero by any mode here. this facility is a perfect illustration of how poorly designed separated infrastructure can be more dangerous than vehicular cycling. like are, i always move over and take the through lane. How so? A reserved lane isn’t a separated facility, you can still change lanes. Part of vehicular cycling is picking the appropriate lane and negotiating the area LIKE A BOSS. this state has a mandatory sidepath law (not that i pay it any attention). Pretty sure in practice that it only applies to cycletracks, adjacent paths and similar arrangements, given that you’re still expected to ride in the next lane towards center of obstructions in a bike lane. spare wheel is correct. the mandatory sidepath law applies to bike striped bike lanes right there in the street. it is possible this particular manifestation is an exception because it is not AAHSTO compliant, in that it is inside a forced right turn lane. but you would have to be prepared to make that argument to a traffic court judge. While I do appreciate PBOT continuing to make an effort on improvements, I completely agree with others above that this intersection is a total mess. The “pre-green” just gets you to your right hook at the next intersection faster. Before I say anything about this signal, I’ll mention that putting a through bike lane to the right of any right-turn-only lane is dumb, stupid, and idiotic. I don’t know why keeping bikes far-to-the-right takes priority over common-sense destination positioning of one’s vehicle. Now then, I didn’t see any mention of it, but after “pre-greening”, does this bike signal then turn red again before the “car” signal turns green? If not, then this treatment is only beneficial for cyclists who encounter a red light here and get queued up before the “pre-green”. If the car (right-turn-only) signal and the bike signal are both green at any time, this is just an invitation to get hooked. If the signals are synchronized so that the bike and car signals are always opposed, then this is merely a silly time-waster for either drivers or cyclists; a “solution” to the made-up problem of having to keep those pesky cyclists all the way over to the right at all times, while still keeping them from getting run over. I tried it yesterday and it was… AWESOME!